The B4MS Community Broadband Project will bring B4RN FTTP (fibre to the premises) connectivity to The Hyning Estate offering a gigabit symmetrical connection (1000Mbps). The project, which began digging in July 2018 is in two phases the first to the West of the River Mint (taking in the whole of Longsleddale) and the second to the East of the River Mint which includes The Hyning Estate. As of today (5th February 2019) the trenching contractors have completed their work in Longsleddale leaving behind a complete network ready for the final bits of fibre to be blown & spliced later this month. 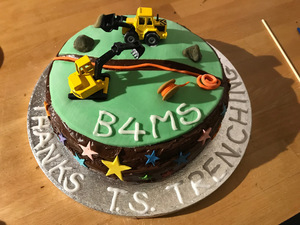 The cake below, from the residents of Longsleddale, thanks TS Trenching for their hard and "hyper-fast" work. The new service is being provided by Broadband for the Rural North Ltd or ‘B4RN’ which was launched in December 2011 by a local volunteer group led by industry expert Barry Forde. Registered as a community benefit society with the FSA (under the Industrial and Provident Societies Act 1965) it can never be bought by a commercial operator and its profits can only be distributed to the community. 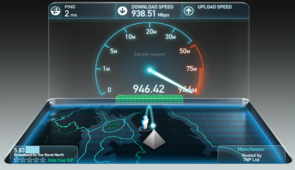 Barry Forde’s background as an industry leading UK specialist in networking, particularly wide area fibre networks, means B4RN is professionally designed to world class standards; fast, resilient, expandable and futureproof. Chris Conder and Lindsey Annison as founding members of the team brought experience from other local community wireless mesh and fibre networks. Monica Lee brought management skills, and so B4RN was born. In 2015 both Barry and Chris were included on the Queen’s Honours list and awarded MBEs.